Conversation, sharing, but above all action. The concept of environmental sustainability cannot be only in the mind of a few people, rather it should be in the hands of those who want to make the difference every day. 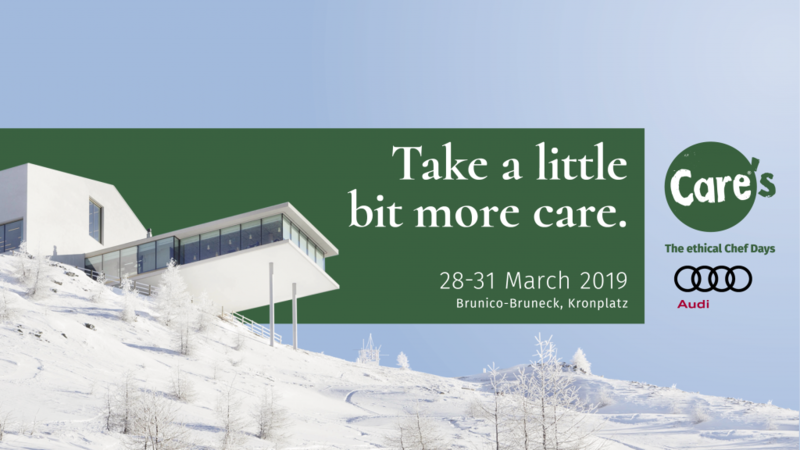 This is the foundation thought of the third edition of Care’s, The Ethical Chef Days, taking place from 28th to 31st March, and moving this time from Val Badia to the near Val Pusteria. As usual, the opening toasting will take place Thursday 28th March at Cantine Ferrari in Trento, where chefs, journalists and guests will open this new edition with Ferrari Trentodoc bubbles. The inauguration will take place first in Villa Margon, a sixteenth-century residence and representation office of Lunelli Group, subsequently at Locanda Margon, the two-Michelin-star restaurant belonging to Ferrari. Saturday 30th March we will be at AlpiNN – Food Space & Restaurant in Plan de Corones, where a wonderful Ferrari aperitif will be served at sunset, followed by the awarding of the recognition Young Ethical Hospitality Award, of which we are the official sponsor. We will award a maitre or a sommelier under 25 years old with one of our customized Jerobaom and a 3-night stay in one of Belmond hotel in Italy. The project conceived by the Michelin-star chef Norbert Niederkofler and by Paolo Ferretti, is sponsored by Cantine Ferrari this year too. Cantine Ferrari totally share the values of this three-day event, which is dedicated to chefs all over the world, who will discuss about the theme Actions speak louder than words, to underline the importance of “doing” for environmental sustainability. An ethical approach towards territory which Cantine Ferrari has been adopting since long time, bringing back the focus on the natural fertility of the soil, the respect for the environment and the wellness of people working there, through the conversion to biological practice for all the estate vineyards, which ended with the biological certification in 2017.